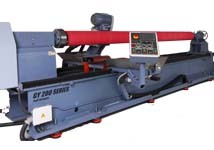 Designed for the sole purpose of grinding or maintaining elastomer covered rollers, packers, pulleys, and pipe coatings, the GY 200 Series offers the latest in elastomer grinding technology. Standard equipment includes a full flood recirculating coolant system, motorized tailstock, variable speed traverse and spindle drives, front and rear independently operated cross-slide saddles, and a rear-mounted direct drive grinding head. Pictured with an HSG 1200 series High Speed Grinder attachment on the rear cross-slide.